The three dimensional model of them wheel was designed using CATIA. Then the IGES format 3D model was imported into ANSYS. In the present work a detailed static analysis – displacement, maximum and minimum vonmises stresses and fatigue analysis of wheel rim under radial loads has been done. 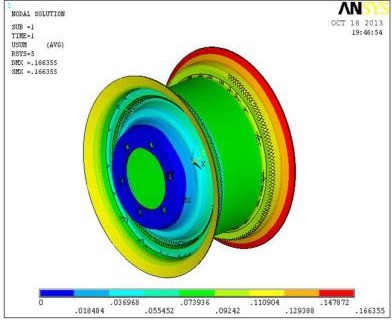 The application of finite element method for analyzing stress distribution and fatigue life of wheel rim was summarized. The rim of a wheel is the outer circular design of the metal on which the inside edge of the tire is mounted on vehicles such as automobiles. Analysis of wheel rim made with materials like alluminium alloy, steel alloy, forged steel and magnesium alloy is done for fatigue strength. The finite element method is a powerful tool or the numerical procedure to obtain solutions to many of the problems encountered in engineering analysis. In this method of analysis, a complex region defining a continuum is discretized into simple geometric shapes called finite elements.The domain over which the analysis is studied is divided into a number of finite elements. The material properties and the governing relationship are considered over these elements and expressed in terms of unknown values at element corner. In the static analysis of wheel rim constraints will be applied on the circumference of the rim. Fatigue analysis is done in MSC fatigue software, uses stress or strain results from finite element (FE) models. Usage of MSC fatigue brings fatigue analysis up front in the design-to-manufacturing process and creates an MCAE environment for integrated durability management. SOLID45 is used for the 3-D modeling of solid structures. The element is defined by eight nodes having three degrees of freedom at each node: translations in the nodal x, y, and z directions. In steel alloy the number of cycles to failure is greater than Aluminium alloy, Magnesium alloy and Forged steel. Hence Steel alloy is more feasible to be used in wheel rim than other materials. Further optimization of material thickness to reduce the material consumption can be done and we can improve life of component by using advanced fatigue strain life approach.